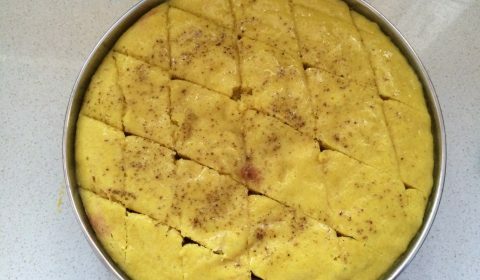 Dhokla is the identifying feature of a Gujju. It comes from the land of Gujarat, India and is now popular around the world. 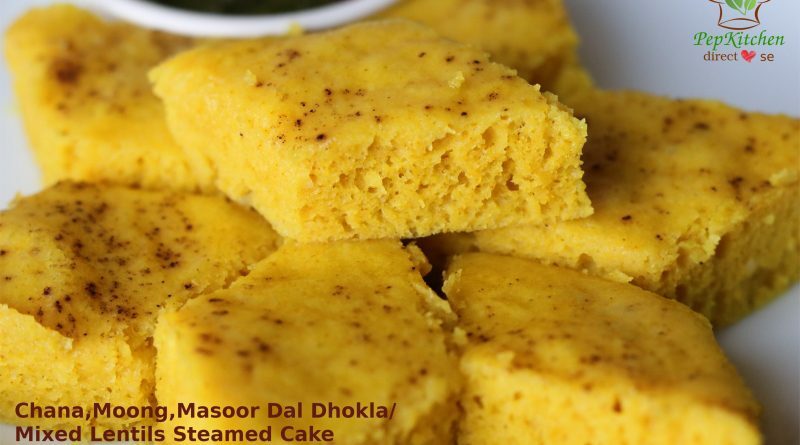 Dhokla is considered to be a very healthy snack as it is made by steaming the batter. It is made with very less oil. It can be served as breakfast, snack with tea or as a savory accompaniment (farsaan) to lunch or dinner. 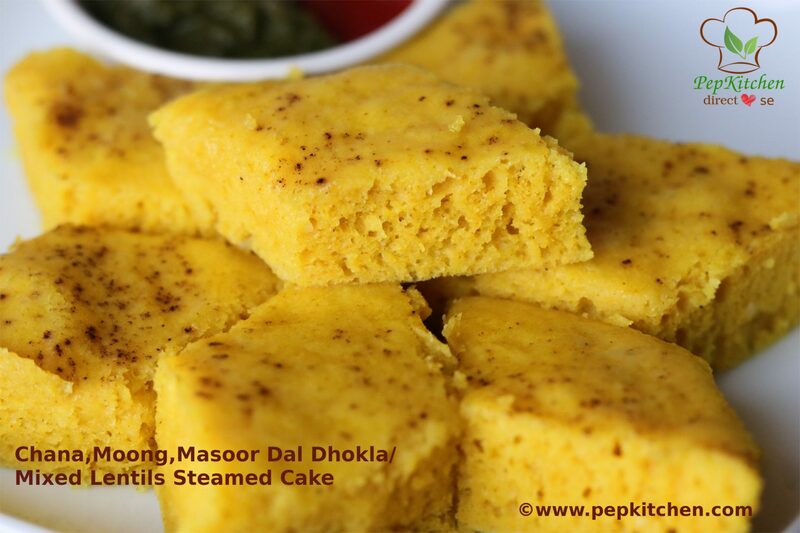 Dhokla is usually made with a fermented batter made by grinding soaked rice and gram dal together in a certain ratio. While cooking, the batter is spiced up with ginger and green chili paste and seasoned with salt. The batter is poured into a greased flat dish/ pan and is steamed in a steamer for 10 minutes. It is cut into pieces and served with peanut oil, chutney, and fried green chilies. Sometimes a tempering made by heating oil and crackling mustard seeds, cumin seeds, and sesame seeds, curry leaves, green chili, coriander leaves, asafoetida is poured over it. It is a deep vessel. The steamer has a stand for making dhokla that has 3-4 flat plates in it. Fill the steamer with water below the height of the dish and let it boil. Fill the plates with batter and fit in the stand. Cover with lid cook for 10 minutes. 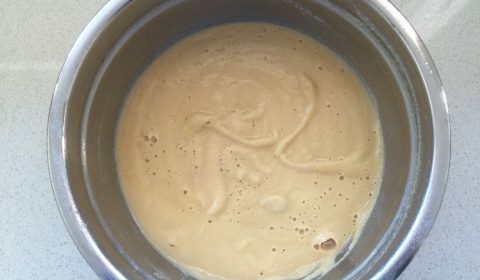 Steam will be formed inside and that will help to cook the batter. Besides dhokla plates, the steamer also has idli molds and a slotted plate to make muthia, patra or steam veggies. But if you do not have a steamer? 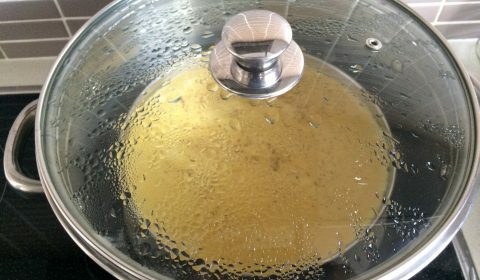 Do not worry, I have shown the method of steaming the dhokla in a big pot. Place a 4-inch stand height ring or stand. Fill water below the level of a ring and let it boil. Place the plate filled with batter on it and then cover with a lid and cook for 10 minutes. I like to experiment making dhokla with different ingredients. I make dhokla with idli batter. Add ginger green chili paste to the batter. Mix well. Pour in the greased plate. Sprinkle black pepper powder or red chili powder and steam in the steamer or pot for 10 minutes. We call it “Idada” and serve them with aamras. 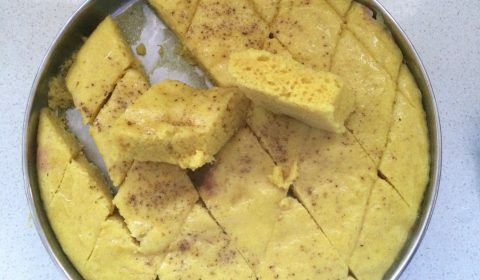 Sooji dhokla is made with semolina and curd mixture. Sprout sooji dhokla is made by semolina, moong sprout, and curd mixture. 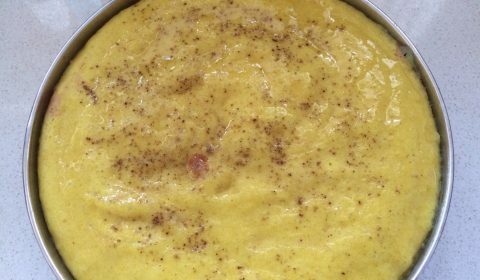 Mix dal dhokla is made by soaking different dal in equal proportions and grinding them and let it ferment for 5-6 hours. 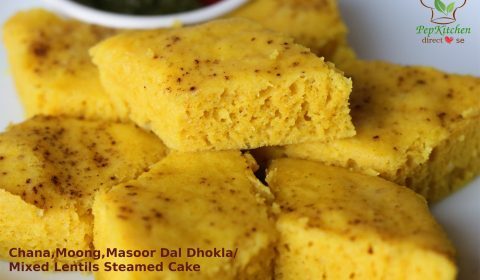 If you do not want to ferment the batter, add Eno (itis a mixture of soda bicarbonate and citric acid) and steam the dhokla immediately. 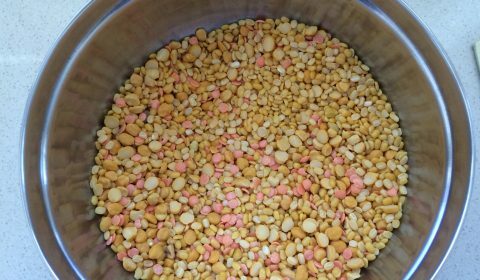 I am sharing with you the recipe for making dhokla with three dal – moong dal (split yellow moong beans), chana dal (split chickpea or gram), masoor dal (split red lentil). 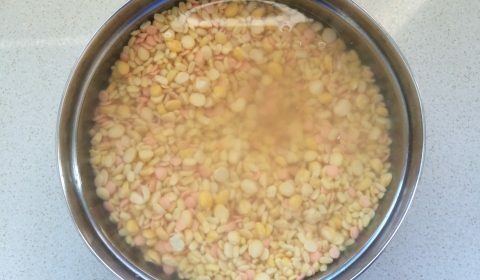 I have soaked these lentils in equal proportion for 4-5 hours, then have ground it into a coarse batter with ginger and green chili paste. 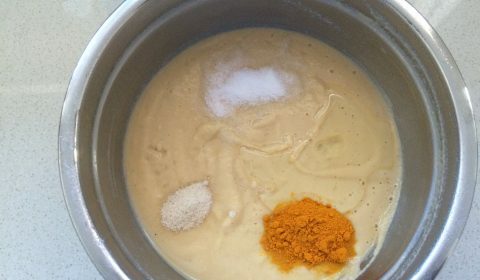 I have added salt, turmeric powder, and asafoetida to it. The batter is ready to steam. If you have time you can keep it aside for a couple of hours. The dhoklas would become softer. 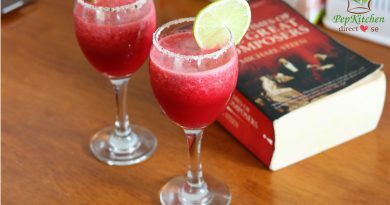 But you can cook immediately by adding fruit salt (Eno) to it. 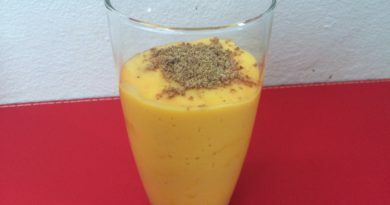 This healthy snack is enjoyed at my home by my husband and son with evening tea or morning breakfast. This is protein rich and also is non-fried. You can experiment making dhoklas this way with different lentils or pulses and you can also make it more nutritious by adding veggies like spinach, methi, carrot, peas or corn. 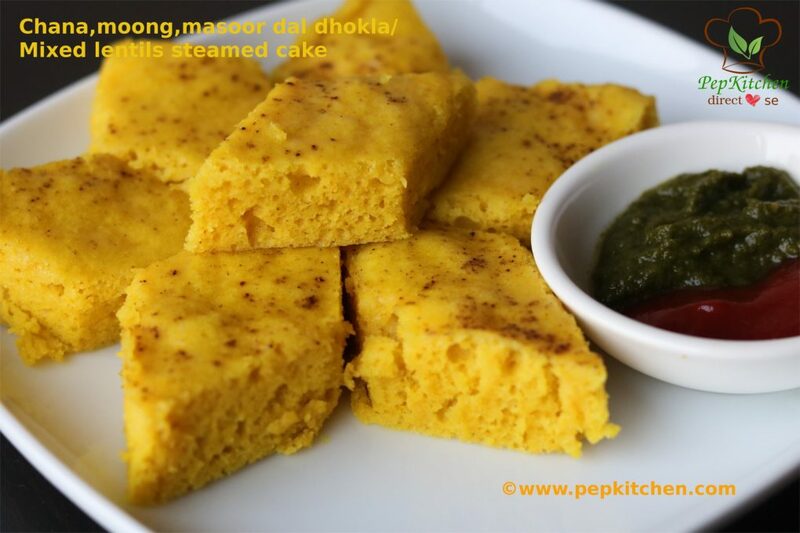 Chana, Moong, Masoor Dal Dhokla/Mixed Lentils Steamed Cake is a very healthy dish containing the goodness of various lentils. It is protein rich, less oil and is a nutritious breakfast or snack to be enjoyed with a cup of tea. 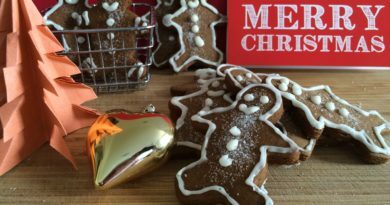 It is liked by kids and can be packed for lunch box or a potluck picnic. It is vegan. Take all the three dal (chana dal, moong dal, masoor dal) in a bowl. Mix them. Wash them twice in the water and then soak them in water for 4-5 hours. Drain the water and put the soaked dal into mixer jar with chopped green chili and chopped ginger. 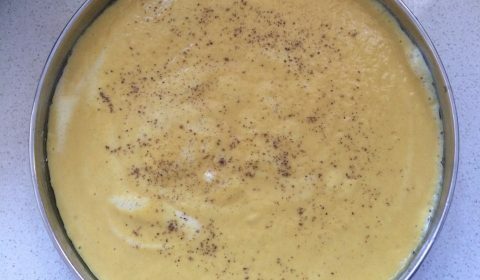 Grind the dal coarsely with 2 tbsp of water. Add asafoetida, salt, and turmeric powder. Mix well and keep the batter aside. 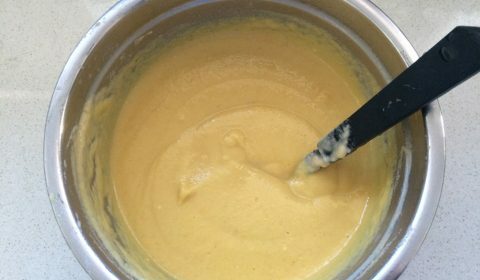 Divide the batter into three parts into bowls. Grease the plates or cake tin/ pan with oil. Pour the water into the steamer or a big pot. Put the stand . Cover with lid and let the water come to boil. Just before steaming take one part of the batter and add 1/2 tsp of Eno on it. Add 2 tsp of water over it and mix gently. Immediately pour the batter into the greased plate /tin/pan. Move the dish clockwise to spread the batter. Sprinkle 1/2 tsp of black pepper powder over it. Put the dish on the stand into the steamer. Cover with the lid and let it cook on high heat for 10 minutes. After 10 minutes the batter is cooked. Remove the plate. Apply 1/4 tsp oil over it. Let it cool. The dhokla is ready. See how beautiful net is formed and it looks so spongy. 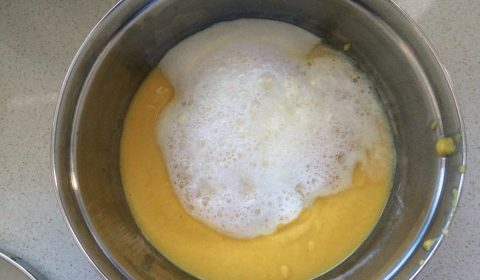 Similarly, make dhokla with the other two potions of the batter. 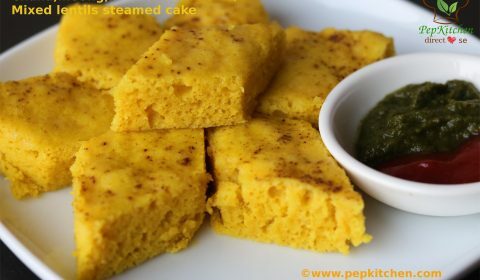 Serve Chana, Moong, Masoor Dal Dhokla/Mixed Lentils Steamed Cake dhokla with green chutney and ketchup. looking so spongy and tempting..